Great title but I am hoping that your not looking for a cure all in this blog post haha! Reality is there are a lot of reasons that scalping occurs and so I figured I would address some of those in this post. The way I see it there are 3 main reasons that scalping can occur and those are mechanical, turf conditions and design issues. So I figure I will address the one I know the most about. Rollers – You really have to choose the right roller for the right condition. Meaning if the greens are soft, spongy, etc having a wiehle (aggressive) roller on the mower is going cause some issues as it sits down in the turf and tends to catch a lot more grass. When its spongy it tends to want to catch and grab due to the inconsistency in the turf its cutting. 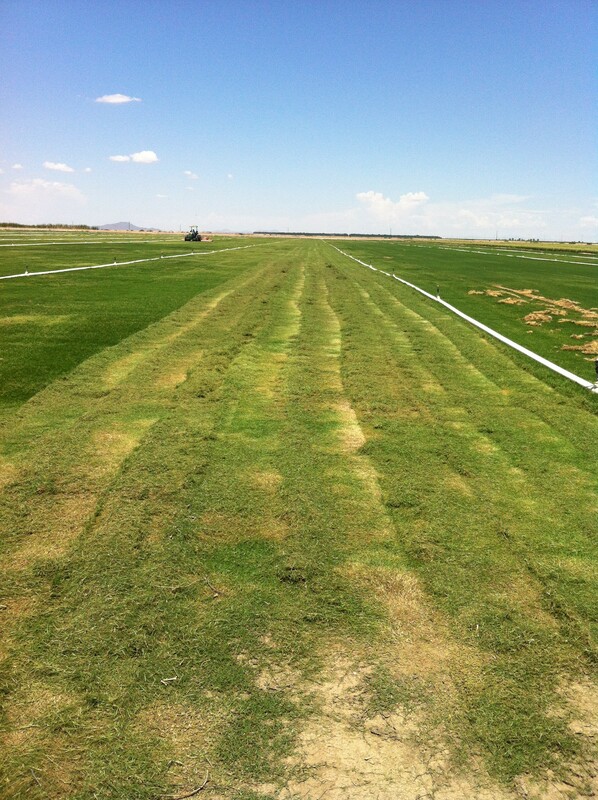 Imagine mowing new sod you hit highs and lows and it scalps them. Spongy turf is kind of that same thing. In these cases I would use a solid roller until conditions are more consistent / firm. There are times, such as in fairways, during the summer months that I want to be aggressive and in fact I have run wiehle rollers on both the front and rear of a fairway mower to get real aggressive during the summer months when the grass is actively growing and can recover so we don’t experience issues during the season. This was done to help combat a serious grain issue in Dallas. Bedknife – The bedknife is the key in many scalping issues. Having the right thickness of bedknife is important. Please don’t look in the manual and it says xyz bedknife is made to cut at xyz height. WHY?, because the manufacturers don’t know what your turf conditions are so that range of height means nothing. The truth is that the cut happens at the top of the bedknife not the bottom so however much bedknife is left from the top of the knife down is potentially a scalping issue depending on your conditions. As an example in Dallas I had to run micro greens mower bedknives on our fairway mowers cutting at .400 because of some turf conditions we had (bad grain). It was the only way to get to the height we were targeting and not scalp the fairways. The thicker the knife the more drag it has and while running a thicker knife will certainly extend your grinding intervals it can also cause you head aches. Now, what I am not saying is to go put greens mower knives on your fairway mowers but what I am saying is to realize that every turf condition is different and can require some changes in order to prevent scalping. Square and Sharp Cutting Units – I have been talking about the importance of squaring cutting units for years and so I won’t spend a lot of time on it but I will just say this. It doesn’t matter how sharp the reel and bedknife are if the cutting unit doesn’t travel down its surface square. The other given is making sure both the reel and bedknife cut properly. If it doesn’t cut it will just tear and it grabs the turf and pulls it out. Go down to go up – This is a simple theory that I started using quite a few years ago and that is to go down below your target height of cut for a week or so then go back up. Let me explain. If our target height of cut on fairways is say .350 I will want to take the fairways down to .325 for a week or so even if I am scalping and then bring them back up to .350. The reason is that we are trying to smooth the fairway out. If I have never been below .350 and we just mow at that height we have a better opportunity to see scalping because as the reel cuts a different direct or hits a different bump it finds another low area or hits a low area at a different angle. During a Tour event I will always do this advanced week so that tournament week we are growing into the target height vs ramping our frequency up and that bedknife finding new areas to grab. Reel Diameter – Reel diameter is one I frequently see as well. Mainly because everyone tries to stretch their cutting units as far as they can to get the most life out of them. The problem is that as the reel wears the bedknife attitude changes and that starts to cause issues. The other thing you see with this is different green speeds on different greens. Example if I send out 3 greens mowers all with different reel diameters they actually cut different amounts of grass. When the bedknife angle is different it lifts the leaf blades up differently (higher or lower on the leaf blade) causing it to cut more or less grass off. This is the same effect using a thicker or thinner bedknife. Using a thick bedknife means there is more thickness from the top of the knife to the ground causing the bedknife to lift the leaf blade at a lower point and a thinner knife will grab the leaf blade at a higher point. So consistency from reel to reel is very important when you are trying to have a consistent surface from green to green. General Maintenance – The obvious ones are bad reel bearings, roller bearings, drums, etc.These are a few of the main things I typically see but there can be a number of other variables like tire pressure, down pressure, overlap, etc. Keep in mind there are also great reasons to scalp from thickening up the turf to smoothing surfaces out so its not always a bad thing. There is a lot to creating the best surfaces you can. Its not as easy as just slapping 2 pieces of metal together and making them cut. It’s a science and its a science that quite frankly gets ignored a lot.